The above Scriptural passage in Hebrew is the opening of the Book of Genesis, the first book of the Torah or the Law of Moses, and describes the First Day of God's Creation of the heavens and the earth. 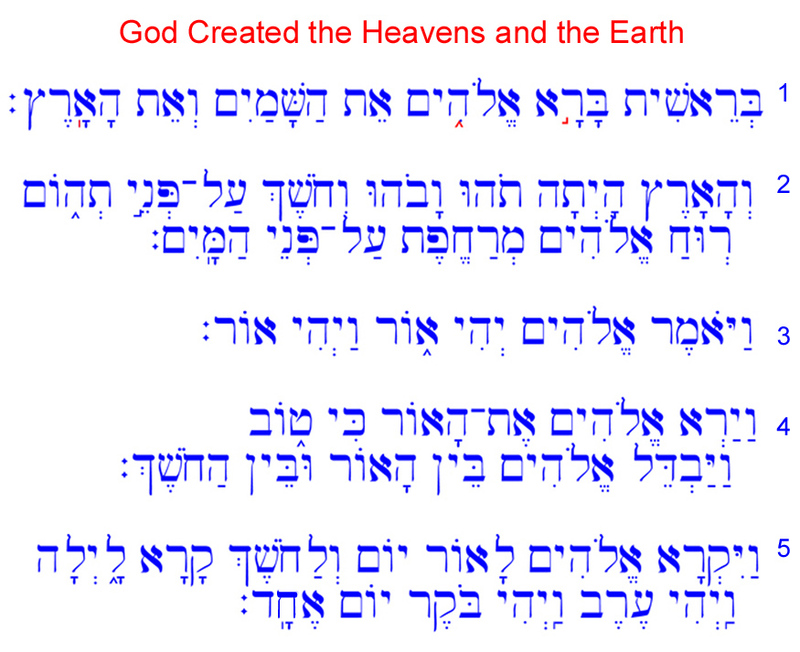 The English translation of Genesis 1:1-5 follows, as well as a comparative Key of Hebrew and English. This page also includes a brief description of Hebrew Accents and Numbers. 5 God called the light "day," and the darkness he called "night." The Tiberian Masoretes, in addition to the vowel points for Biblical Hebrew, developed accents or cantillation marks for the Biblical text. The accents perform three functions. Their primary function was to indicate the music for singing or reciting Hebrew Scripture during worship. A second function of the accents is to present the interrelationships of the words in the text. The third function is to mark the position of stress in the word. Accents fall into two groups, either disjunctive or conjunctive. Disjunctive accents mark a pause or break in the reading of a verse, as may occur in the completion of a thought. Conjunctive accents connect two words that go together, as two nouns in a construct relationship. Hebrew accents are a complex subject in themselves. There are 27 prose accents for the 21 prose books, and 21 poetic accents for Psalms, Job, and Proverbs, 12 of which are specific for poetry only. The three important accents, which are consistently found in all 24 books of Hebrew Scripture, are displayed here. Genesis 1:1 above has three accents or cantillation marks that are red in color. Reading from right to left, the first one is munah, a conjunctive connecting בָּרָא with אֱלֹהִים. The second is atnah, a disjunctive that indicates both a pause in the verse and the stress in the word. The third accent is silluq, a disjunctive that indicates the last word of the verse, as well as the stress in the word. Please note that silluq is the same symbol as metheg, which, when accompanying a vowel, indicates that the reader is to briefly pause to allow full pronunciation of that vowel. Silluq is followed by the punctuation mark sof pasiq, which indicates the end of the verse, similar to our period.